February 2012 - A Life From Scratch. It was at exactly 1:31AM that I heard the three dreaded words uttered, ‘my ear hurts.’ I bolted up to see L in obvious pain, tugging on his left ear. Ugh, I know how painful those things can be. They are nothing to be messed with. After some Motrin to take the edge off, the next two and half hours were spent doing what I like to call the ‘night shuffling.’ First L and I started off up in his bed. We weren’t sleeping. Then we went downstairs, kicked M out, and tried sleeping together in my bed. Nope, not working. Then I went upstairs to tell M to go and try and sleep with L and that wasn’t the magic combo either. Finally around 4AM we gave up and resorted to movie watching on the couch. Throughout the whole night shuffling, I had two things on my mind. 1. Poor L and 2. Work. If you’re a working mom or have been, you’ll get it. You have to have a plan decided around 8AM as to what will occur for your day as you need to check in with your boss and your childcare situation. Your mind spins with your different options until you decide on a plan. I kept telling myself, yes it hasn’t been the best night sleep but I will be the first appointment at the DR’s walk in, get the prescription, pick up the medicine, drop L at my mom’s, and be in by 9. Yes, that was the plan. Finally it was a somewhat acceptable hour to consume breakfast so I got the red Keurig flowing and sat down to my yummy plate and began to surf my favorite morning blogs like always. Except my finicky Ipad wouldn’t connect. REALLY? This made me oddly irritated. Although I did sleep for about 2.5 hours total so I suppose that isn’t all that shocking. 7:56AM rolls around and we are walking hand in hand into the DR. We are the first ones, as always. I am always baffled by this – how can we have been the only ones that have been up all night? Anyways, first ones in means first ones out, perfect. Prescription in hand we walk towards the car right on schedule (with the promise of making L these cookies later) only to have L stop to throw up from the pain. Poor little guy! We finally make it to the car and then just for good measures sake, throw up one more time in there. At that point L turned to me with glassy eyes and says ‘momma, I just want to be home today.’ I couldn’t agree more L. I couldn’t agree more. And that is when I gave up. The working mom guilt sets in. You know what is right, there is no question. Staying at home to take care of L is the right thing to do. No deadline or feeling of dedication at the office can supersede the look in his eyes and the tone of his voice. He needs you and frankly you need to be with him. So that is what I did. I’m not even exactly sure why I wrote all this. I think, if you are a mom, that you can relate in someway to what I am talking about. At least, I hope I’m not alone in feeling this way. I don’t think I am. To get back to food a bit here (sorry! ), throughout the leaky faucet and prescription pick up and work emails I happened to have just one more thing on my mind. I watched the Pioneer Woman ladle thick and cheesey corn chowder into warm bread bowls on the Food Network the night before and the image was permanently branded into the forefront of my brain. I couldn’t think of a better time to try such an indulgent recipe than on a day like today. Bowls of this by the fire while watching the snow fall and bedtime by 8. Exactly what the DR ordered. Preheat a large Dutch oven to medium/medium high heat. Melt your butter. Saute the onion for a few minutes, and add the bacon. Saute until cooked through and the onions are translucent. Add in your peppers and saute a few minutes, then add your corn and cook another minute. Sprinkle the flour evenly over the top and stir well to combine. Add in your chicken stock and stir here and there for a few minutes to help thicken. Reduce the heat to low and stir in your half&half. Cover for 15 minutes to thicken even more. Uncover, stir in your cheeses and green onions. Taste to add salt &/pepper. 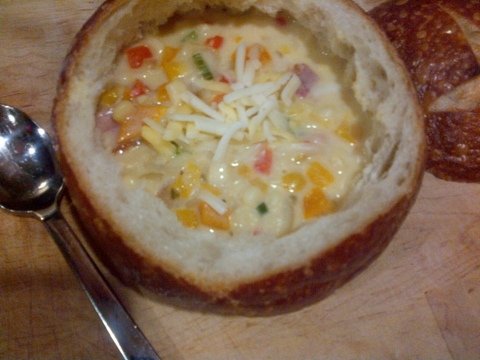 Cut off the top of your bread bowls, remove the bread 'innards' and ladle the cheesy goodness into your bowls. Cover with the tops for extra dipping. We had a really great meal last night. It was a sloooow cooked Cuban braised beef and pepper stew. 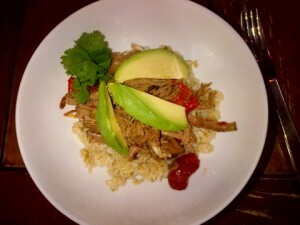 The recipe was a twist on the classic Cuban dish called ‘Ropa Vieja.’ In Spanish (as long as we are trying to practice that in our home) it means “old clothes.” The slow cooking process of the meat and colored vegetables literally makes them fall apart, thus resembling a jumble of rags. And what a tasty jumble of rags indeed! 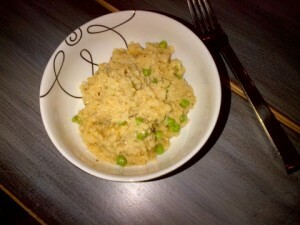 I think this is my first slow-cooker meal I have posted on this site. While I do tend to use mine from time to time I really do prefer cooking as the best way to unwind at the end of the day. This meal reminded me though how wonderful it can be to throw everything in a pot, leave for the day, and come home to not only a delicious smelling home but an absolutely delicious meal. This recipe calls to be served over white rice. I upped the health factor a bit by using brown. When it was all together and assembled it was kind of like making your own burrito bowl at home. Dig in and enjoy – Andale! In a slow cooker, combine all the ingredients up until the meat. Nestle the flank steak in the vegetables and cook, covered, until it is tender and pulls apart easily. (High for 4-5 hours, low for 7-8 hours). Cook your rice according to the package directions. Using two forks, shred the beef and fold it gently into the cooking liquid. Serve upon the rice and top with the avocado and cilantro. For some reason, in my mind, risotto always seemed…well, difficult. I didn’t grow up eating it, so it was never natural to serve it in my home. Recipes for it just seemed fussy and labor intensive to me and to be frank, a bit scary. I don’t know about you – but I never have 45 minutes straight to stand over my stove babysitting something in a pot. Typical cooking for me consists of running in and out of the kitchen multiple times. I was sold. This recipe is baked in the oven. How genius is that? You do, essentially, nothing for 45 minutes and then stir in lovely ingredients at the end. Voila! You have yourself a gorgeous dutch oven full of creamy, rich, risotto. I could not get enough of it. The flavor was out of this world and paired amazing with a cold glass of sauvignon blanc. I felt…fancy! This meal is enough of a rock star to be served on its own, but you could of course serve it as a side as well. There are minimal ingredients that go in so make sure you are using the best you can find. Place the rice and 4 cups of the simmering stock in a Dutch Oven. Cover and bake for 45 minutes, until most of the liquid is absorbed and the rice is al dente. Remove from the oven. Add the remaining cup of stock, parmesan, wine, butter, salt & pepper, and stir vigorously for 2-3 minutes, until the rice is thick and creamy. Add the peas and stir until heated through. Serve hot. Who needs a fancy restaurant? Not you. A new trick for up your sleeve. I’m a firm believer in the statement that a way to a man’s heart is through his stomach. Approaching 8 years of marriage I can say one of my strongest points is my kitchen abilities. I am the first to recognize that at times I’m not always a peach to live with so somehow this is all working out A OK thanks to what I can produce for our table. I always have that to fall back on. So the statement, to me, is very true. But you don’t have to always go with the stomach – sometimes it can just start with a smell. And that’s where this little trick comes in. I can almost guarantee you that if you make this, and put it in your oven at the appropriate time, and your significant other walks in the door that you will have won him/her over. The smell alone will make them swoon and forget that you never ever remember to turn off your curling iron or keep your car clean or bring out the garbage when he travels or that you might have made one too many purchases at say, J Crew or Nordstroms. The timing has to be right though, so be sure to coordinate with their schedule. I made sure I knew what train M was on, got the oven ready, and then slid my creation into the oven once I knew he’d be in his car driving home. Like clockwork 15 minutes later he walked in the door to what can only be described as one of the best smells in the world. Yes, I’ve still got it. What IS this creation I’m talking about? Well, it comes from my mom – so we know it’s good. She gave us these amazing blueberry muffins and the best black bean soup ever. 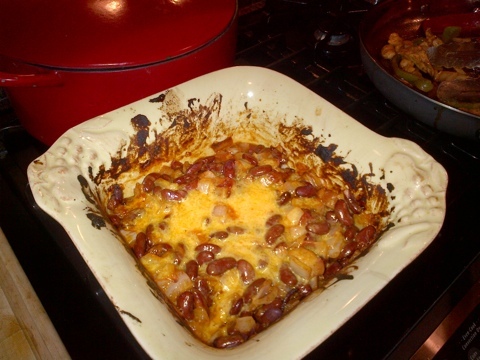 This time it’s her ‘California Mexicali Beans.’ I promise you, even if you aren’t a baked bean kind of person (I’m not) the smell alone will win you over. You’ll most likely have a bite or two…and then be hooked. Oh, and they are much better than your standard baked beans you think of sitting in a sad dish at a potluck. Make them along the side of fajitas (locals, they make awesome ready to sizzle marinaded chicken or steak with veggies at Orchard Prime Meats in LZ), make them on a taco night, make them as a side to juicy burgers. They are crazy easy and your best sure fire bet to gain a point or two back with your significant other. Not that YOU need it….wink wink. Preheat your oven to 400 degrees at just the right time. Combine all ingredients, except the cheese. Bake for 45 minutes in a covered casserole for 45 minutes. Sprinkle cheese all over the top. Cover again and bake for 15 additional minutes. I honestly can’t believe I haven’t posted about these green beans. They appear in our home almost weekly regardless of the season. They sit along nicely next to some grilled chicken in the summer or just as nicely next to some warm and comforting crockpot chicken in the winter, like we enjoyed last night. I guess I haven’t posted about these because to me they are, well, boring. And I mean that in the best possible way. They are boring because they are painfully EASY, come out perfect every single time, and I know M will gobble them up. (Something he often refuses to do when the color green is involved). These aren’t a challenge, these are something you can throw together in an instant and literally cook in your sleep. The search for your perfect go to side is officially over. If you are a green bean fan, or even if you aren’t, I suggest stocking up on the few basic ingredients to keep these on rotation in your home. I promise they’ll go down easy! Preheat your oven to 425. Line a baking sheet with foil (easy clean up). a handful of green beans for every person you want to serve. (2 people would be 2 handfuls). Grab a handful of green beans for every person you want to serve. (2 people would be 2 handfuls). Slice up some fresh cloves of garlic, one for every handful. Sprinkle with some sea salt and freshly ground black pepper. Drizzle olive oil all along the top. Toss together with your hands. 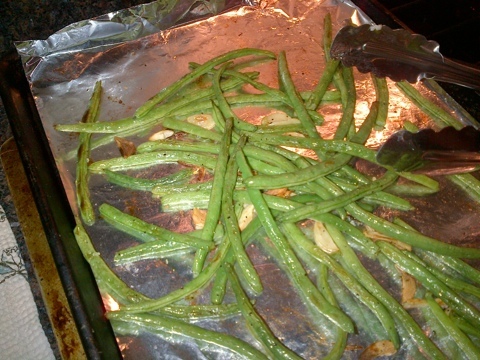 Roast for 15 - 18 minutes, until the green beans have a nice roasted color and the garlic is extremely fragrant.